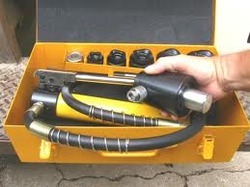 Punch Hole Diameter (Inch): <2"
Hand operated Hydraulic Punch driver is used to make hole with manual hydraulic pump with punch in Electric field when desired hole need in available junction box on any soft sheet M.S, Copper, Brass, Aluminium, PVC and fiber etc at sight without electricity and drilling. Splitter Punches suitable for various holes according to PG & Metric sizes, Punches and Dies, Standard Punches, Square/Rectangular & Special size Punches, Nibbling Tools, Hydraulic Hand Punches, Compact & Light weight Combi Hand Hydraulic punches, Hydraulic/ Electro Hydraulic / Pneumatic Pumps & accessories etc. 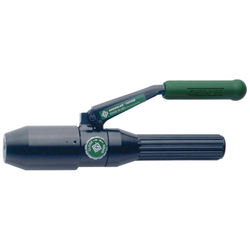 Our reputed entity is engaged in supplying Hydraulic Punch Driver.